Use 12 oz. per 100 lb. 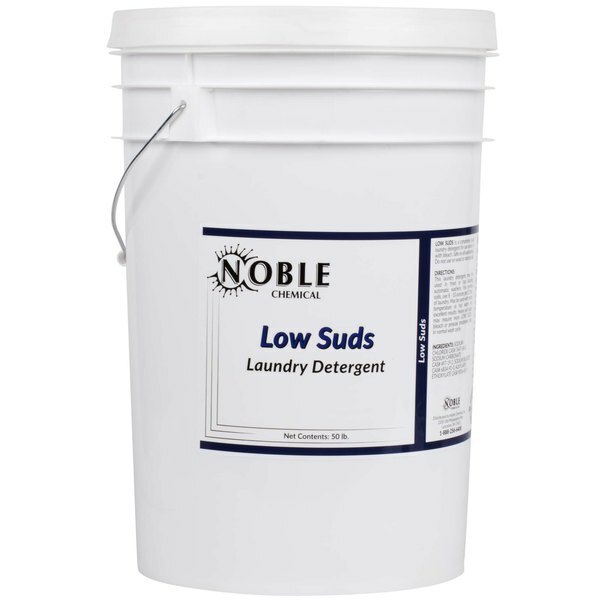 Get your uniforms, towels, and other textiles fresh and clean with Noble Chemical Low Suds laundry detergent. 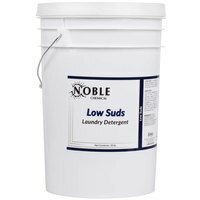 Noble Chemical Low Suds laundry detergent is perfect for use in hotels, laundromats, restaurants, and schools. It thoroughly cleans your clothes and other laundry without clogging your machines during automatic wash cycles, thanks to its low-suds agents. 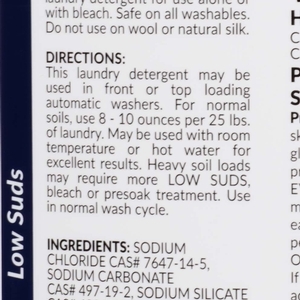 This detergent also features borax and other brightening agents to keep your clothes, towels, uniforms, aprons, and other laundry looking great. Its 50 lb. container also ensures that you’ll have enough detergent to keep your commercial establishment running smoothly. "I love how well this works for the price! It leaves garments clean and smelling fresh. The 50 lb container is a steal and it lasts a long time." 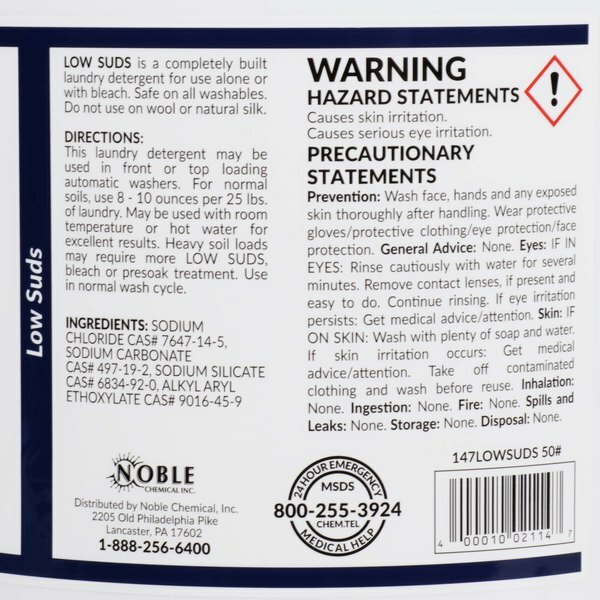 To use Noble Chemical Low Suds laundry detergent, simply use it with your washing machine according to the instructions printed on the label. For more soiled clothing, add more detergent for extra stain fighting power. This product is sold in bulk 50 lb. containers that feature a convenient handle, so you can easily transport and store your extra detergent. This detergent is specially designed to brighten your laundry using borax and other enhanced brightening agents. 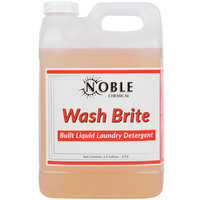 Noble Chemical brand supplies are a smart addition to any restaurant, hotel, or healthcare facility, and this handy detergent will keep your laundry sanitized and disinfected. Be sure to check out our quantity discounts for even better wholesale savings! How many loads of laundry can I get from one bucket? Depending on the size and the type of your machine, as well as the type of loads, you can expect between 100 to 200 loads. 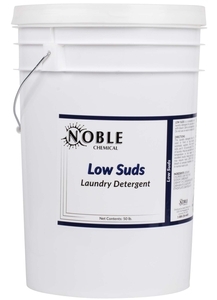 Item #: 147LOWSUDS 50# Noble Chemical Low Suds Laundry Detergent - 50 lb. 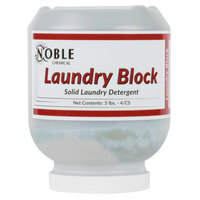 Overall User Rating: Noble Chemical Low Suds Laundry Detergent - 50 lb. Seems to work great. We use this with some oxyclean on all our kitchen towels, rags and aprons. Everything comes out as clean as the big name brands. Good Soap for my daycare. I do laundry everyday and this container can last me about two months. It is way cheaper then any name brand soap and has the same results. Best detergent I've used. I don't like hauling laundry detergent home from the store, and I think they're all ripoffs anyway. I bought this when I read it has a lemon scent and has borax in it. I was stunned at how clean my first load in my new HE (top load with dual agitator) machine and this detergent came out...and with NO pretreating. Same with my second wash, which was a king-size white mattress pad I use for dogs on a sofa. Soaked 1/2 hour in the detergent only, and it is bright white again. No signs of any stains. I transfer a manageable amount into a smaller box which I leave in the laundry room. I highly recommend this detergent. As usual going commercial gets you a better quality product and saves money. I love how well this works for the price! It leaves garments clean and smelling fresh. 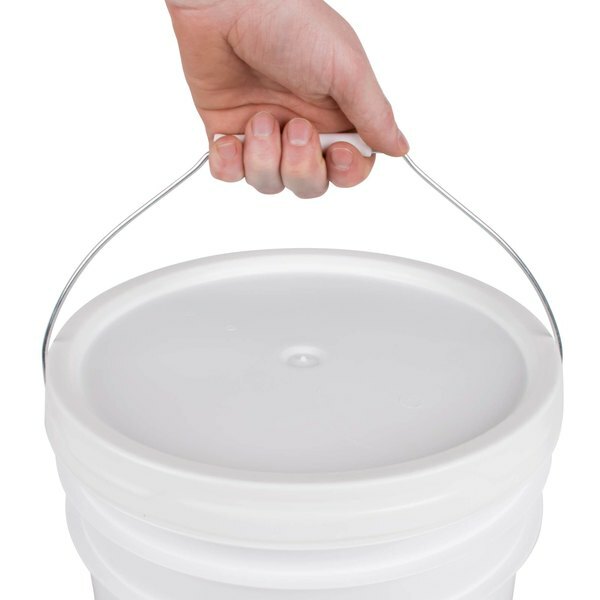 The 50 lb container is a steal and it lasts a long time. We do some basic laundry here. And this laundry detergent is exactly what we needed we really will like the powder and it 50 pounds the size can't be beat. A nice bulk bucket of laundry detergent that is a great price. Really does a great job getting clothes cleaned and leaving them smelling great. Saved us lots of money. Our towels and chef coats always come out clean and smelling fresh. Very simple to use. Have gone threw many cleaners but I am a fan of this one. Absolutely love this “low suds” product. There’s no BUBBLES all over the place!! Thank you for providing such an Awesome product. I will definitely be purchasing again!! 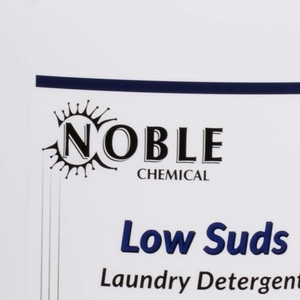 The Noble Chemical Low Suds Laundry gets your linens clean and is low cost. I would highly recommend this for any hotel, restaurant and even for home use. With cleaning, comes laundry. 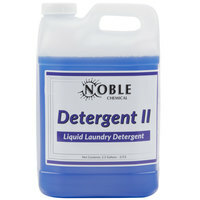 This detergent works great for washing our bar mop towels and even for our dining room linens. Will continue to buy this product. 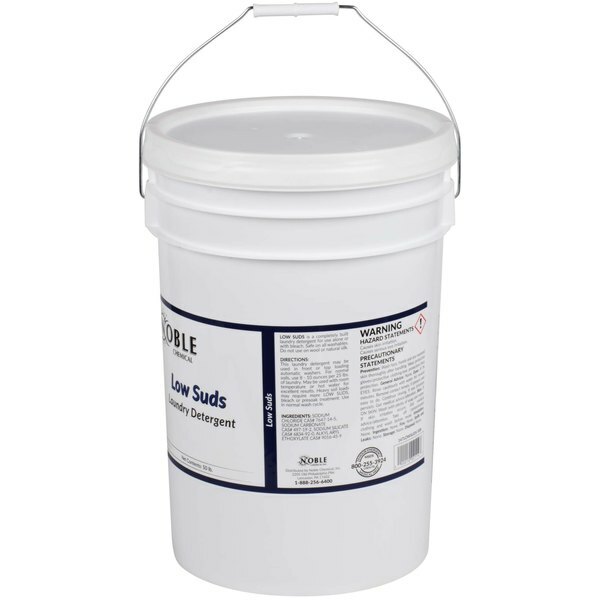 A nicely priced bulk 50 pound bucket of Noble Chemical low suds laundry detergent that works great for hotels. The detergent cleans the sheets perfectly and works perfectly with my washers. This product works very well, I will buy it again. We use it on our Chef uniforms and kitchen towels at work. I also use it at home on all our other laundry from bed linen to everyday clothes. It gets the items clean even our greasy kitchen towels. The cost is far better than most of your brand name laundry soap and works just as well if not better than some. This is bulk basic detergent, don't expect it to work any miracles on greasy kitchen towels, but anything normal it's great for, and runs at a very good price! Wow, I am loving these gigantic tower of Low Suds Laundry Detergent that has a scoop inside and is very easy to carry and open for use. 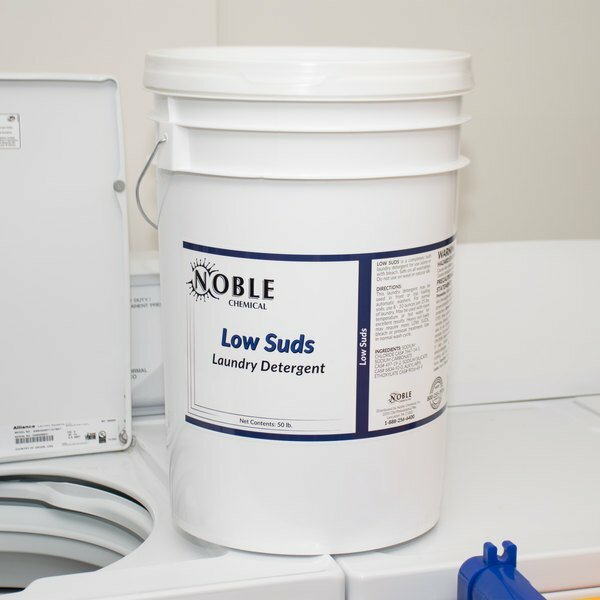 Low suds detergent works great on my front loading washer even though it is powder form. I simply apply the detergent inside the washer and not is the compartment. It leaves my clothes clean and smelling good. Initial loads of laundry have come out fine. Good price if you do your own towels and linens and saves you a million trips to the store.